Highlights: 74 point win Watch the key moments from Collingwood's huge win over St Kilda at the MCG on Friday night. 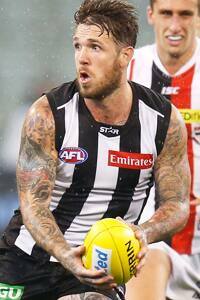 Friday's match was the 151st time Dane Swan has played on the Melbourne Cricket Ground. Dane Swan notched a unique record when he took on St Kilda last Friday night. And it had nothing to do with his 39 disposals, either. The match was Swan's 151st at the Melbourne Cricket Ground, meaning he now stands alone as the Magpie to have played the most games at the home of football in the club's history. Of the 1,122 players to represent Collingwood since 1897, only Scott Burns (150 games) and Nathan Buckley (148 games for both Collingwood and the Brisbane Bears) come within touching distance of the 2011 Brownlow Medallist. VOTE: Your 3-2-1 in the Magpie Army Player of the Year Award. Swan first played at the venue back in round 16, 2003, when he won 13 disposals in Collingwood's 69-point win over Richmond. He had previously played at the 'G during the 2001 TAC Cup finals series where he was a member of the Calder Cannons' Under-18 premiership team that September. Richmond legend Kevin Bartlett has the most MCG appearances of any VFL/ AFL player in the game's history with 200. Of the current players, only Essendon's Dustin Fletcher (184 games) is ahead of Swan. All statistics are courtesy of AFL Tables.